This month marks the ten-year anniversary of Argentina’s massive sovereign debt default, an event with many lessons for the European sovereign debt crisis of today, though analogies are far from perfect. First, as has been discussed and debated on planet money and naked capitalism, the Argentine economy actually recovered quickly from the painful default and crisis of 2001 after it negotiated a substantial write-down of its sovereign debt. Second, the experience of Argentine’s neighbor Uruguay shows that the economic pain of such crisis is less severe if a more orderly restructuring is employed from the start rather than a chaotic default. Such an orderly restructuring could have taken place in Greece two years ago as it did in Uruguay ten years ago as veteran debt expert Carlos Steneri and I discuss with Juan Forero in this NPR price “What Greece Can Learn from South America” which aired last week. (I worked closely with Steneri during the Uruguayan crisis when I was US Treasury Under Secretary). 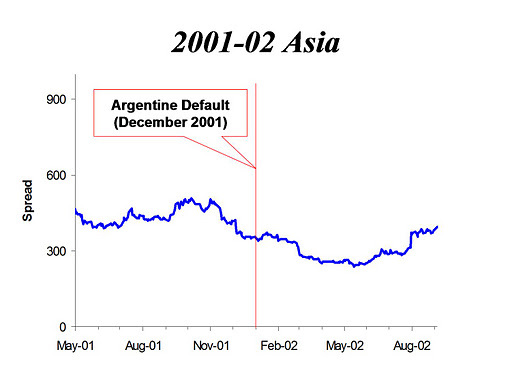 Third, and most important, despite the immediate and sharp impact of the default in Argentina, there was very little international contagion at the time of the default. 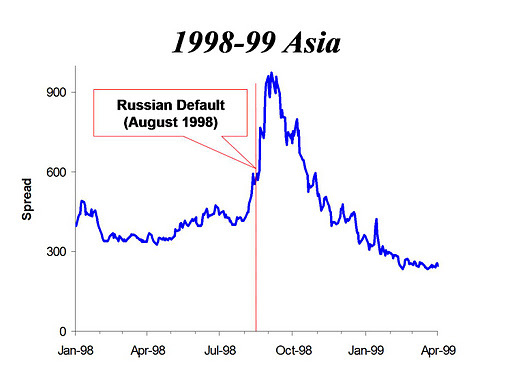 This outcome was contrary to many warnings at the time that such a default would have large contagion effects much as the Russian default three years earlier in 1998. The first chart shows the contagion following the Russian default in terms of emerging market bond spreads in Asia. The second chart shows, using the same measure, that there was virtually no contagion following the Argentine default. In my view the reason for this remarkable difference is that the IMF and the international policy community was clear (at least following an increase in loans in August 2001) that the bailouts of Argentina would stop, making a debt restructuring inevitable or at least more predictable than the surprise withdrawal of support for Russia in 1998 which caused the contagion then. Contagion is not automatic if the policy is clear and predictable. As the investigative reports in the Wall Street Journal this week make clear, this same type of fear of contagion (expressed, according the the WSJ story, very strongly by Jean-Claude Trichet during the past two years) is why a restructuring of Greek sovereign debt has been kicked down the road so many of times. Instead of reducing the role of bailouts as occurred for emerging markets around the time of Argentina, the role of bailouts in European policy has increased and this has made policy even less predictable. As the prospects of bailout increased, the political incentives to take action to reduce deficits and debt decreased as evidence in Italy over the past year and made the crisis much worse.